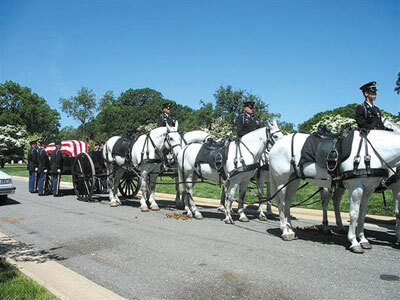 Robert H. Johnson, 86, of Tyrone, Pennsylvania, who died April 2, 2008 was given a full military honors funeral and burial on Thursday, May 29, 2008 at Arlington National Cemetery, Washington D.C.
A horse drawn caisson carrying Johnson, accompanied by a 30-member color guard and an Army Band, marched in procession through the cemetery to his grave where services were held. Taps was played by an Army bugler followed by a 21-gun salute and then the playing of “America the Beautiful” by the Army band. Johnson was a United States Army Captain serving with the 94th Infantry Division in World War II. He was awarded the Silver Star for exceptional gallantry. He served two stints in the Army retiring in 1961 following 28 years service. He is survived by his wife Phyllis, two sons David and Steven and three grandchildren. 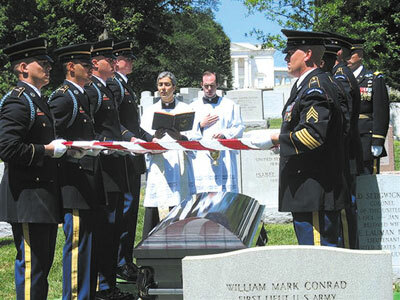 A daughter Mary Theresa preceded him in death and is also interred at Arlington.